If you are having a party that airbrush and temporary tattoo’s could add some fun and expression to, look no further than MAGIC BY DAVID! Airbrush tattoos are fun, fast and water proof! They are perfect for large scale events, or events with many attendees that need to be serviced! School events and corporate events are ideal for airbrush body painting. 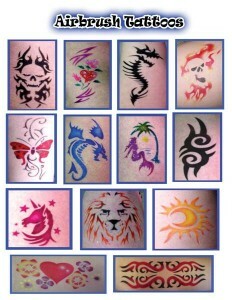 As many as 50 guests per hour can be serviced with a single airbrush tattoo artist. Booking an Airbrush Entertainer is fast and easy with MAGIC BY DAVID. Simply call or email us for a quote 919-266-1682. Airbrush Party Entertainers service Raleigh NC and surrounding areas.